Brussel sprouts are one of those vegetables that have a reputation of being difficult to like. The leafy green vegetables look like miniature cabbages – mostly because they are related to cabbages – with a mild, cabbage like flavor. They can be prepared in a number of different ways, but the best way to prepare them, without a doubt, is to roast them in the oven until they’re crispy. Oven-roasted brussel sprouts have mild, slightly nutty flavor and a good balance of tender interior and crisp exterior. Served with a little salt or a little Parmesan cheese, they can be delicious. In fact, they’re good enough to make you wonder how they got a reputation of being difficult to like. They can be even more delicious when you introduce a little browned butter to the equation. Roasted Brussel Sprouts with Browned Butter are one of my favorite ways to prep these vegetables. I split the brussel sprouts down the center and roast them, cut side down, on a baking sheet until they’re crispy. While they cook, I prepare a little browned butter on the stove top and simply toss the roasted brussel sprouts in the butter before seasoning and serving them. The browned butter adds a wonderful toasted flavor to the sprouts and makes them taste much more complex than they would on their own. I like to buy my brussel sprouts on the stalks, partly because those huge stalks look cool and partly because I feel that the sprouts are fresher when they’re still attached to the stem. Choose brussel sprouts that are small, with tightly wrapped leaves and no discoloration. These will be milder and more tender than larger brussel sprouts (although those are perfectly good roasted, too). This recipe can be adapted to any amount of sprouts, whether you’re serving them as a Thanksgiving dish or simply making them as a side for a dinner for two. Preheat the oven to 400F. Line a baking sheet with aluminum foil and lightly grease. Slice the sprouts in half lengthwise, removing any loose, outer leaves and trimming the bottom stems. Melt 1 tbsp of the butter (you can also spray them with cooking spray) and quickly toss the brussel sprouts in it, then arrange them cut side down on prepared baking sheet. Bake 400F for 20-30 minutes (depending on size), or until browned. While the brussel sprouts roast, brown the remaining butter. Place butter in a small saucepan and cook over medium heat until the butter starts to brown and develops a toasty aroma, about 10-15 minutes. Remove from heat. 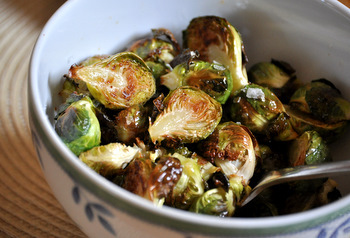 Place roasted brussel sprouts in a large bowl and toss with browned butter. Season with salt and pepper, to taste. 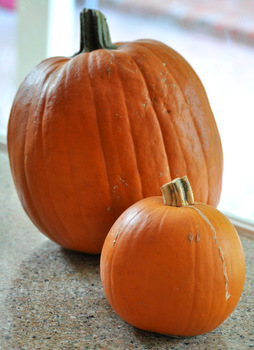 What is a sugar pumpkin? Previous PostPrevious What is a sugar pumpkin? Brussels sprouts are among my favorite vegetables, and this looks absolutely FANTASTIC!! I love your blog so much! I have never tried Brussel Sprouts. Maybe I have too! Those look great! Love roasted BS…. 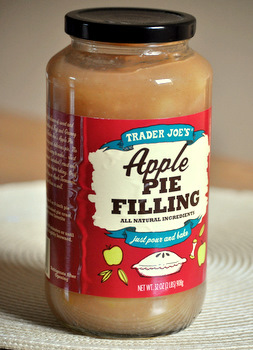 Can’t wait to make them on T-Day WITH the Browned Butter… yummm-OH! the most magical time of year « I Should Cocoa!